Donald Trump’s first White House Christmas cards were a simple cream-colored design featuring the Presidential Seal, embossed in gold foil, inside a thin gold foil border. Inside, also printed in gold was the message, “Merry Christmas and a Happy New Year” in an elegant script font, followed by the signatures of the President, First Lady and 12-year old son Barron. Mr. Trump made a point of including the words Merry Christmas in the cards as opposed to his predecessor, President Obama, who always used a more secular, non-religious verse. A special, supersized burgundy version of the card was sent to all Senators and Congressmen. In keeping with The Donald’s obsession with all things bigger & better, the cards sent to Congress were nearly four times the size of an average Holiday card. New York City real estate developer and reality TV star Donald J. Trump was elected America’s 45th president in November 2016. Despite no prior governmental experience, the billionaire businessman ran as a Republican and scored an upset victory over former First Lady, Senator and Secretary of State, Hillary Clinton. Trump began his career working for his father’s real estate development firm, taking over its leadership in the 1970s. 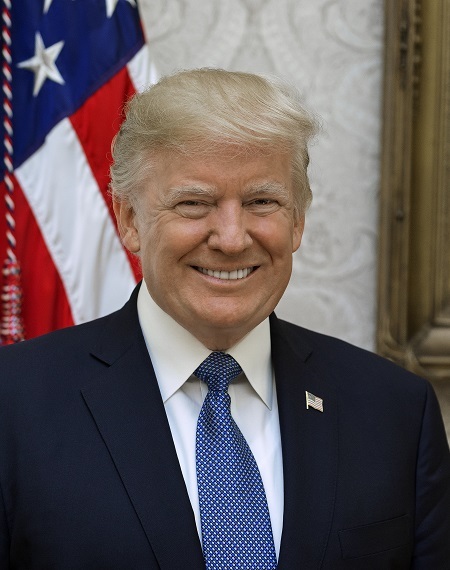 Over the next few decades, he built hotels, office towers, casinos and golf courses and also created and starred in the hit reality TV show “The Apprentice”. After college, Trump joined his father’s company, which developed apartments in the outer boroughs of New York City. He became president of the firm in 1974 and went on to make a name for himself in the Manhattan real estate world with the construction of several high-end hotels. Also in the 1980s, Trump opened hotel-casinos in Atlantic City, New Jersey; acquired Manhattan’s storied Plaza Hotel; and bought the Mar-a-Lago estate in Palm Beach, Florida, which he turned into a private club. His other ventures included brief ownership of an airline and the New Jersey Generals of the short-lived United States Football League. In 1987, he published his autobiography, “The Art of the Deal” which became a best-seller. In 1989, his net worth was 1.5 billion. However, the early 1990s saw an economic recession and a slump in the real estate market. Trump was deeply in debt and several of his casinos filed for bankruptcy. In 1995, he reported a nearly $1 billion loss on his taxes. Trump eventually made a financial comeback, due in part to a business model that involved licensing his name for a wide variety of items, ranging from luxury condominiums to steaks, beverages and neckties. He continued to acquire and develop real estate properties, including office buildings, hotels and golf courses around the world. In 2016, he became the first billionaire elected to the White House. Before winning the U.S. presidency, Trump never held any elected or appointed government office. In 2011, Trump began questioning in TV interviews whether President Barack Obama was born in the United States. In the following years, he helped fuel rumors about Obama’s birthplace while growing his audience on social media and gaining the attention in the world of conservative politics. Eventually, President Obama felt the need to release his long-form Hawaiian birth certificate in 2011 (he had released his short-form birth certificate in 2008). In June 2015, the real estate developer announced his presidential candidacy in a speech at Trump Tower. His simple and effective campaign slogan was “Make America Great Again,” the message printed across the baseball hats he often wore at his rallies, and spoke out against political correctness, illegal immigration and special interests, while promising to cut taxes, scrap or renegotiate trade deals and create millions of manufacturing and other jobs for American workers. His brash, unapologetic style and often-controversial comments earned widespread coverage in the press. Political opponents and many in the media accused him of bigotry and xenophobia. In May 2016, Trump clinched the Republican nomination, beating out a field of 16 other candidates, including early-favorite Jeb Bush, Chris Christie, Ted Cruz, Marco Rubio and John Kasich. In the general election, Trump ran against Democrat Hillary Clinton, the first female presidential candidate from a major political party. The race was divisive, in part due to a number of inflammatory remarks and tweets made by Trump about his opponent, minorities, and other groups, including undocumented immigrants. While many members of the Republican establishment distanced themselves from the candidate, Trump’s supporters admired his bombast, outspokenness and business record, along with the fact that he wasn’t an overly-polished politician. As the election neared, nearly all off the polls predicted a victory for Mrs. Clinton. However, on November 8, 2016, in a stunning upset, Trump and his running mate, Governor Mike Pence of Indiana, defeated Clinton and Virginia Senator Tim Kaine. Trump’s victory came about in large part due to the votes of blue-collar workers in the traditional Democratic strongholds of Pennsylvania, Wisconsin & Michigan. He tallied 306 electoral votes to his rival’s 232. Clinton won the popular vote by almost 2.9 million.